Last Saturday, we hosted our annual Thanksgiving/Christmas party. It seems to have become our little tradition now that we have done it for 3 years in a row. And I have to say I really enjoy the whole process from shopping for grocery (especially when I get to go to a cheese counter ;-)), preparing food, setting the table to watching my friends eating my food. However, we have rather limited space, and having everyone comfortably sitting down around the table is not an option. 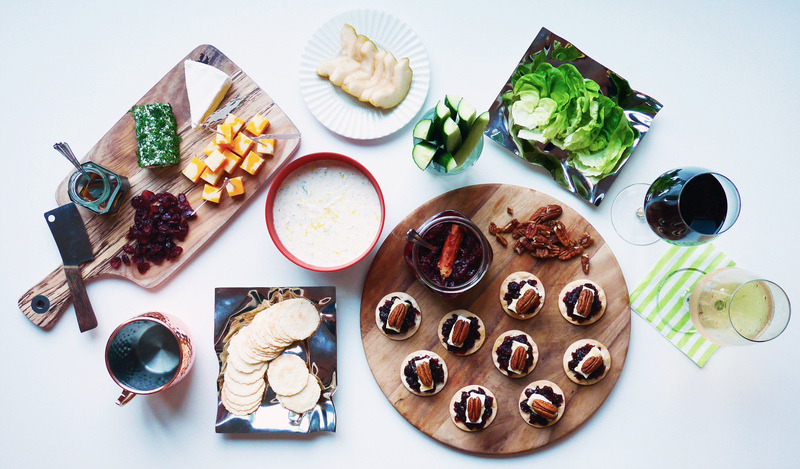 So the challenge always is to come up with lots of finger food that is easy to pick up, not too messy or fussy to eat but still delicious and pretty. I am sure that I’m not the only person with this challenge, so today I would like to share some of the quick and easy dishes I prepared for the party. Only cooking you have to do here is making cranberry sauce and smoked salmon dip, which cannot be easier. And with all the beautiful smell and colors, trying these recipes will put you in a very festive mood. Enjoy! 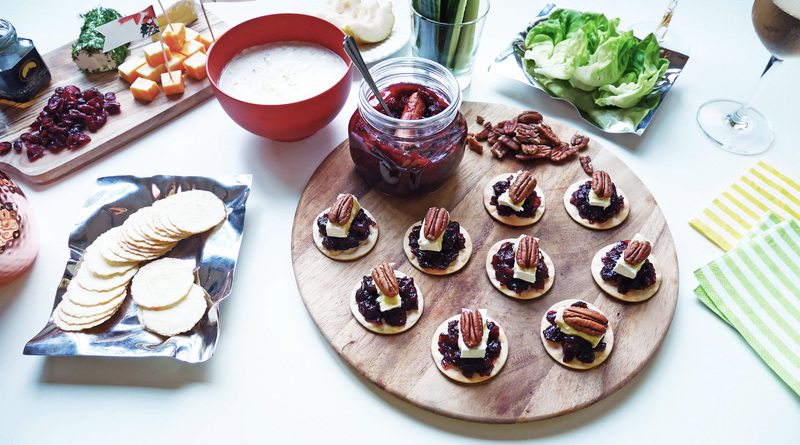 To make the sauce, soak dried cranberries in boiled water for 10 minutes. Scrape off the vanilla seeds and set aside with the pod. After 10 minutes, place all ingredients in a saucepan and bring it to a boil. Once it starts boiling, bring the heat down to medium and simmer for 12-13 minutes (or until it reaches the consistency you like). While simmering, gently crush the cranberries with wooden spoon or rolling pin. Discard vanilla pod when the sauce is cooked. You can leave the cinnamon stick as a decoration. 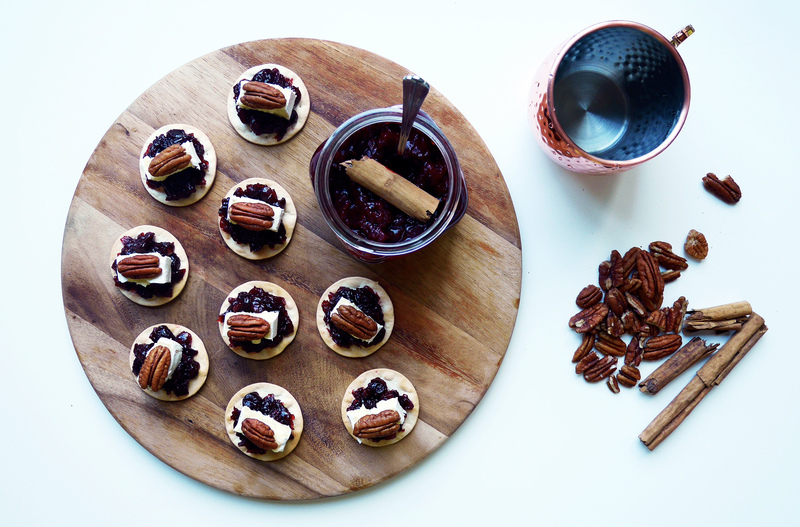 When the sauce is cool enough, spread it on crackers and top them with little pieces of brie and pecans. Roughly chop smoked salmon and mix with rest of the ingredients. Blitz the mixture in a food processor until it reaches smooth and creamy texture. 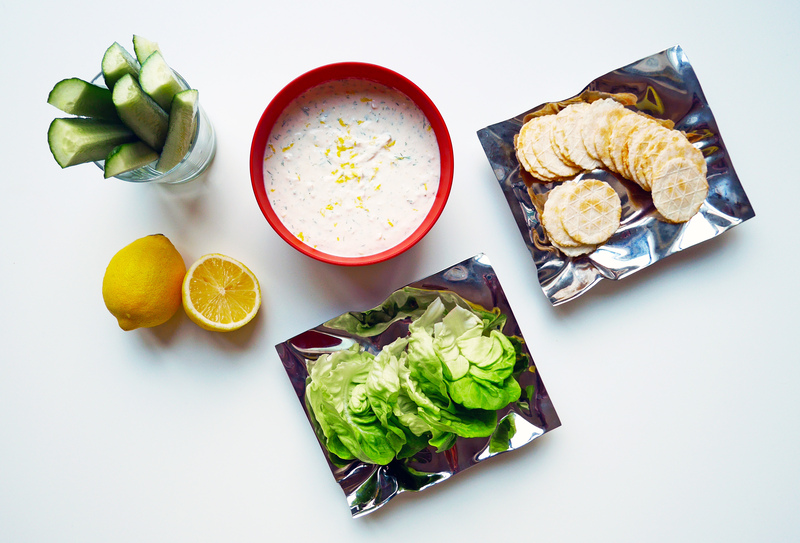 Serve it with crunch vegetables and crackers. Roll goat cheese over finely chopped dill leaves. Chop marbled cheddar into bite-size squares. 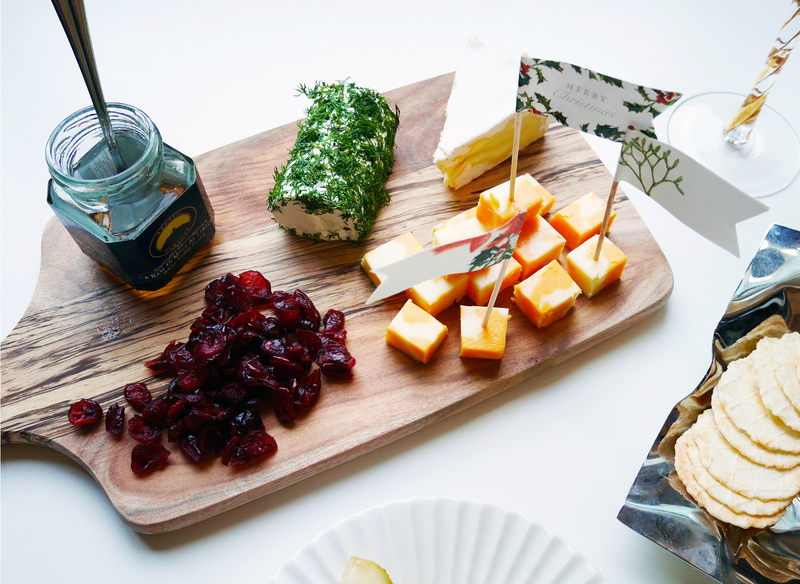 Plate them with brie, white truffle honey and dried cranberries. Serve it with sliced pear and crackers. Feel free to use any cheese you like. 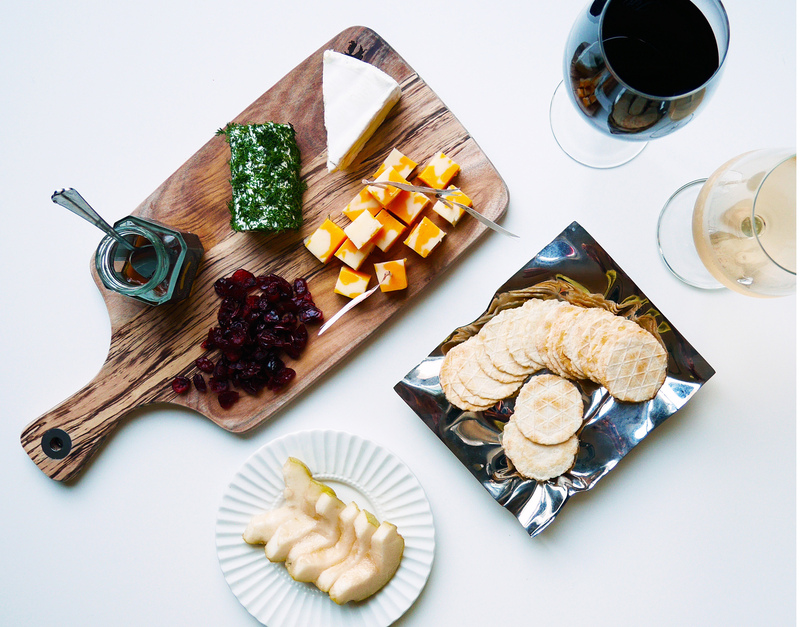 The key to a good cheese plate is to have the balance of flavors, good quality cheese and vibrant colors. And enjoy my home country when you go later this month, I think it is. Let me know if you need help with any questions or connections with good people.